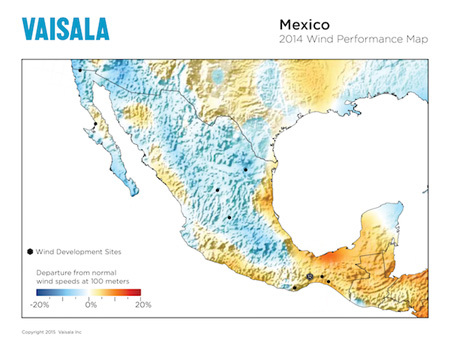 The 2014 Mexico Wind Performance Map, released by Vaisala, delivers positive news for much of southern Mexico where above-normal wind speeds boosted performance at many of the country’s operating wind projects. Conversely, wind speeds below the long-term average in Mexico’s interior negatively affected overall production at wind farms in that region. These departures from mean wind speed highlight the importance of gaining a deep understanding of how much seasonal and year-to year variability is possible at a location prior to major investment. This is critical as Mexico looks to encourage a substantial influx of international capital to grow its domestic wind energy sector. Since wind speeds have a direct impact on wind production, an increase or decrease of 5% can have a 5% to 8% impact on power production, depending on the wind sensitivity of the region. Last year, wind speeds were 5% below normal in Mexico’s interior, from the U.S. border south to Mexico City, which had an adverse effect on the performance of a number of operating projects—including the 50-megawatt (MW) Los Altos wind farm in Jalisco, owned by Grupo Dragón. Fortunately, southern Mexico, where the vast majority of the country’s wind assets are located, did not follow the same trend. Plus, the dense wind development area around coastal Oaxaca experienced wind speeds 5% higher than average. The Oaxaca region—in particular the cluster of projects around Juchitán de Zaragoza—is of key strategic importance to international wind energy investors. Acciona has 550+MW of operating wind farms in Oaxaca, and Iberdrola owns several other large projects in the vicinity. Oaxaca’s Isthmus of Tehuantepec boasts one of the strongest wind resources in the country due to unique topography that creates a natural wind funnel through a break in the Sierra Madre mountain ranges to the North and South for air traveling from North America and the Caribbean. However, though the meteorological reasons behind the strength of the wind resource in the region are well understood, it’s important to note that strong climate anomalies, positive and negative such as those experienced in Mexico last year, are by no means isolated or uncommon events. Should Oaxaca experience a low wind year, a large number of operating assets would experience substantial dips in production and corresponding reductions in their owners’ revenue streams. Vaisala’s study underlines a growing need for ongoing operational reconciliation to better understand the root causes behind performance fluctuations and better diversify a portfolio of assets. Through its wind performance analysis, Vaisala provides valuable insight for financiers and operators, by translating meteorological and forecasting data into energy investment decisions—enabling them to perform regional portfolio analysis and quickly view the effects of weather anomalies on existing and proposed investments. “The ongoing growth of the Mexican wind market, particularly in important regions like Oaxaca, is exciting,” said Nic Wilson, Vaisala’s Regional Segment Manager for the Americas. 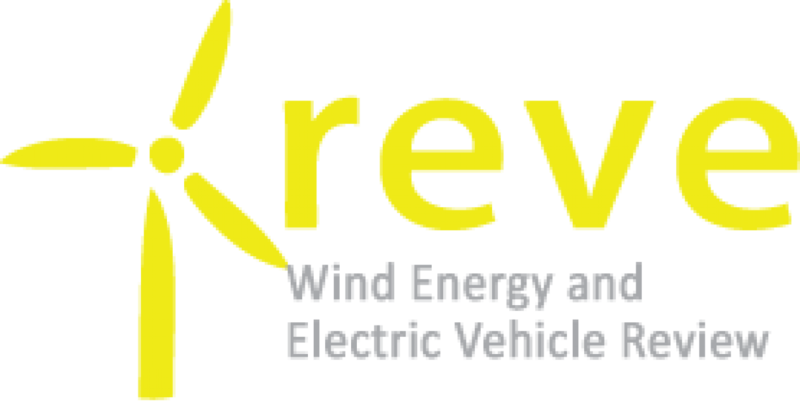 Vaisala is currently working with the U.S. Department of Energy on a $2.5 million, three-year study to improve the reliability of wind forecasting in complex terrain. The results of which will make significant advancements to the weather models used to predict long-term and short-term wind energy production, as well as reduce the cost of grid integration. Click here to download a copy of the 2014 Mexico Wind Performance Map.